Flickr is one of the world’s most popular photo sharing websites, and represents a key way in which people form impressions about different parts of our planet. In other words it is an important part of the digital augmentations of places. Antonello Romano has been doing some great work mapping content from the site, and I’ve pulled some of his data together into this map. What we see are huge differences in the amount of images augmenting different parts of the world. To anyone familiar with some of our previous research, this will be unsurprising. But it is again perhaps the scale of some of these differences that never ceases to astound. I’ve shaded each country as a percentage of the USA’s total rather than as absolute numbers, so that this digital information inequality can be better visualised. You can see, for instance, that there are only five countries in Africa that have more than 0.1% of the USA’s total number of photos about them. These geographies of information matter: they shape what is known, and what can be known about a place. And even in our age of connectivity, large parts of the planet remain left off the map. Digital social data are now practically ubiquitous, with increasingly large and interconnected databases leading researchers, politicians, and the private sector to focus on how such ‘big data’ can allow potentially unprecedented insights into our world. 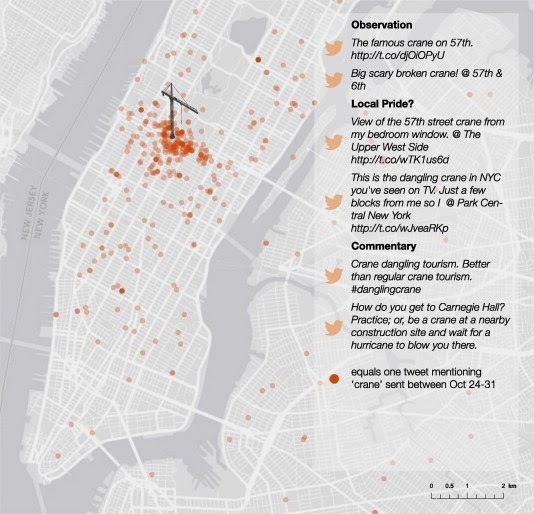 This paper investigates Twitter activity in the wake of Hurricane Sandy in order to demonstrate the complex relationship between the material world and its digital representations. Through documenting the various spatial patterns of Sandy-related tweeting both within the New York metropolitan region and across the United States, we make a series of broader conceptual and methodological interventions into the nascent geographic literature on big data. Rather than focus on how these massive databases are causing necessary and irreversible shifts in the ways that knowledge is produced, we instead find it more productive to ask how small subsets of big data, especially georeferenced social media information scraped from the internet, can reveal the geographies of a range of social processes and practices. Utilizing both qualitative and quantitative methods, we can uncover broad spatial patterns within this data, as well as understand how this data reflects the lived experiences of the people creating it. We also seek to fill a conceptual lacuna in studies of user-generated geographic information, which have often avoided any explicit theorizing of sociospatial relations, by employing Jessop et al.’s TPSN framework. Through these interventions, we demonstrate that any analysis of user-generated geographic information must take into account the existence of more complex spatialities than the relatively simple spatial ontology implied by latitude and longitude coordinates. Shelton, T., Poorthuis, A., Graham, M,. and Zook, M. 2014. Mapping the Data Shadows of Hurricana Sandy: Uncovering the Sociospatial Dimensions of 'Big Data’. Geoforum (52) 167-179. (free pre-publication version available here). We’d welcome any comments or questions about the paper. Stefano De Sabbata and I recently finished mapping the GeoNames Gazetteer, and you can see the full description of results and our maps at the OII’s Internet Geography website. Gazetteers are frequently employed to geocode information from news or social network streams, and GeoNames is one of the largest and most frequently used dictionaries. A more detailed representation of areas afflicted by conflict or disasters may therefore result in these topics being found to be disproportionately prominent in datasets. Similarly, areas that are characterized by very few geographic representations are likely to become stuck in a vicious cycle of informational inequalities. By not appearing in the gazetteers themselves, they are unlikely to ever become present and visible in other geocoded datasets. I’ve had a few people ask what I mean when I use the term ‘data shadow.’ I’ll attempt a very brief explanation here. Matt Zook and colleagues used the term back in 2004 in order to describe the ways that personal information can be incorporated into surveillance regimes. More recently, I’ve found the term useful to articulate the layers of digital information created about places. In other words, the ways in which various contours of places can be represented on our digital canvases. Data shadows can take a variety of forms, but most are manifestations or byproducts of human/machine interactions in what Martin Dodge and Rob Kitchin call code/spaces and coded spaces. Graham, M. 2013. The Virtual Dimension. In Global City Challenges: debating a concept, improving the practice. eds. M. Acuto and W. Steele. London: Palgrave. (in press). Graham, M. 2010. Neogeography and the Palimpsests of Place. Tijdschrift voor Economische en Sociale Geografie. 101(4), 422-436. Graham, M., M. Zook., and A. Boulton. 2013. Augmented Reality in the Urban Environment: contested content and the duplicity of code. Transactions of the Institute of British Geographers.38(3), 464-479. Graham, M and M. Zook. 2013. Augmented Realities and Uneven Geographies: Exploring the Geo-linguistic Contours of the Web. Environment and Planning A 45(1) 77-99. I'm particularly interested in tracing the 'data shadows’ idea further back in time. So would welcome any links and references that help me do that. Comments and thoughts on whether 'data shadows’ even serves as a useful function would also be welcome.